China's grassroots anti-bribery websites may all be shut down because they are not registered with authorities, the Nanfang Daily reported Thursday. Bribery-reporting websites have been burgeoning this week, allowing Internet users to share their experiences in giving bribes though shying away from revealing corrupt figures. Inspired by the Indian anti-bribery site ipaidabribe.com, at least eight Chinese online forums have sprung up since last Friday, bearing names with similar meanings. But safety concerns and an assumption that authorities will not give them the go-ahead are stopping many from registering their anti-bribery websites, choosing instead to operate unregistered and at the risk of being shut down. The founder of one site, who refused to give his name, said none of the anti-bribery websites filed for registration with authorities because the process involves the owners having to provide their real names. He said the content of anti-bribery sites may put the founders' safety at risk of revenge, hence their desire for anonymity. He added that many assumed they would not get the green light to run their sites if they did try to officially register them, and they would be directly targeted for shutdown. 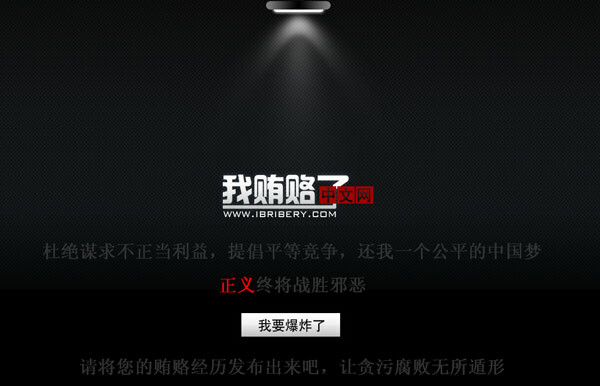 The only link on the front page of Chinese bribery-reporting website www.ibribery.com could not be opened on Friday.